Kooheji Golden Gate has partnered with Ajmera Realty and Mayfair Housing, two international real estate companies, to launch a grand residential development in Bahrain styled the Golden Gate project. The Golden Gate project aims to be the highest residential tower in Bahrain with a total of 746 apartments overlooking the striking views of Bahrain Bay, with specially designed architecture that celebrates two culturally rich countries in one place. This ambitious undertaking promises a blend of state-of-the-art living, modern hospitality and world- class business centres and represents a highly desirable freehold opportunity for buyers. Golden Gate will have two towers and aims to be the jewel in the crown of Bahrain Bay standing tall across from the iconic Four Seasons Hotel, Bahrain Bay. 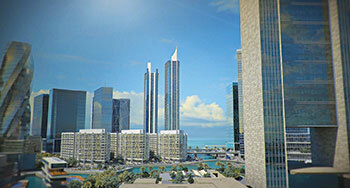 The two towers will be of 45 and 53 storeys each. All three companies involved have an extensive and impressive background in the business with a century of experience combined and are highly respected in the local and international stage, as well as being experts in taking challenging ventures from its early stages to successful completion. Kooheji Golden Gate’s story dates back to 1889 and is deeply rooted in the kingdom and widely respected. No wonder KGG is known as a forward looking family real estate business, combining history with a deep understanding of real estate and expertise in investment. With decades worth of investments and trade between Bahrain and India, the Golden Gate project is bringing them closer together to develop this property that will give a new meaning to real estate in Bahrain. Uniquely, this joint venture brings together the joint development expertise to efficiently manage all aspects of on-time delivery, while leveraging off the legacy and market knowledge of the renowned Kooheji Group. Such partnerships and investments with renowned companies such as Ajmera Mayfair can boost the real estate infrastructure in the country, which complements the economic growth attracting more foreign investments as Bahrain is launched as an important and popular destination for trade and innovation. The chairman of Kooheji Golden Gate Ishaq Al Kooheji calls this partnership as "a realisation of great achievement, as well as making Bahrain a prime example and stepping stone for future development in the region and the world. The start of this joint venture began in 2007, when the Crown Prince His Highness Shaikh Salman bin Hamad Al-Khalifa led a major delegation to expand economic relations between Bahrain and India". The Kooheji Group has been a well-established and reputable family company, which combines history and a great understanding of the real estate market in Bahrain. Golden Gate is aiming to become the "jewel in the crown" in Bahrain Bay, with its sun-defying glazed windows and stylish, modern interior, making it the ideal destination of choice in the real estate scene in Bahrain. Manoj Ishwarlal Ajmera, managing director of Ajmera commends Manama in being "a national symbol of ambition and innovation", a city that is constantly evolving for the better. The relationship between Bahrain and India has been a long and successful one, and continues to be so, which translates into their work and development of Golden Gate’s concept and design, he said. Such factors have encouraged this partnership. Nayan Arvind Shah, chairman of Mayfair Housing says: "Bahrain has been known for being the heart of major trade routes, which still manages to bring in investment and house the headquarters of many global banks in its capital city of Manama, giving Bahrain the status of an ideal place for projects and investment." The collaboration between the companies came about with their shared values, history and end goal to put Bahrain in the spotlight of innovation and luxury. Such a venture between Bahrain and India will increase investment coming into the country as well as bring international attention to Manama and transform it into the coastal metropolis of the 21st century.